Learn more about each title by clicking on an image below. Each set includes all 6 of these titles. Priced at $15 per set. Priced at $40 per set. Priced at $148.50 per set. BEST VALUE! ONLY 99¢ PER BOOK! Each set includes all 8 of these titles. Priced at $20 per set. Priced at $50 per set. Priced at $198 per set. To order these sets, use this Educator order form. You can also order all children’s books by the pack with our standard order form. Shipping charges not included with listed prices. 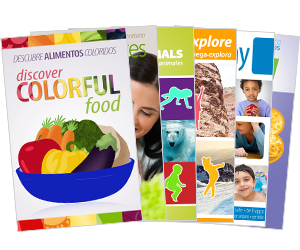 Each book teaches healthy living using different themes. Readers learn new vocabulary in both English and Spanish. Each book also features more learning opportunities, such as: color recognition, counting, learning about animals and their habitats, and following directions. Our children’s books reinforce healthy choices and behaviors! As a bonus, books include more detailed information and easy tips to help parents make healthy lifestyle changes in their families. Ideal for sending home for nightly reading. On every page, children can learn words and phrases in English and Spanish! 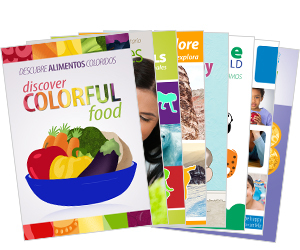 Our books are perfect for students to take home and read with Spanish-speaking parents. They are also a great tool for teaching English to adults or for middle or high school Spanish classes.